yea well, since the reverse of this is how I pulled muscles last week I am out tonight, y'all have fun :-) Way to crush it Shane! If the reverse was how you pulled a muscle, then this should put it back in place nicely. Thanks Oatie but the BK did it with me and was at like 5:45. 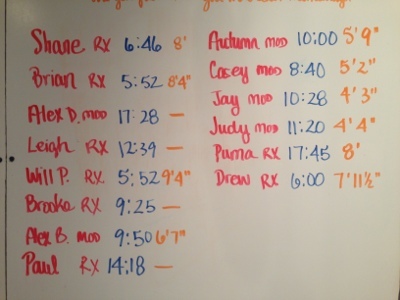 Tomorrows wod is...just show up...you don't want to know...no trust me...you really don't want to know. That's a little scary Cori! Love seeing that 8' next to my name. Keeps me right there with Brian and Shane (at least on something! ).